Hey there. It’s Friday. I hope you all have a fun weekend ahead of you. There’s something GOOD coming up on Monday, so definitely check back in when you’re trying to avoid that email in-box. Remember all of those photos I posted of hills covered in wildflowers? The only reason I shot those on our March road trip was because Death Valley and Antelope Valley weren’t ready. We were early on the blooms. 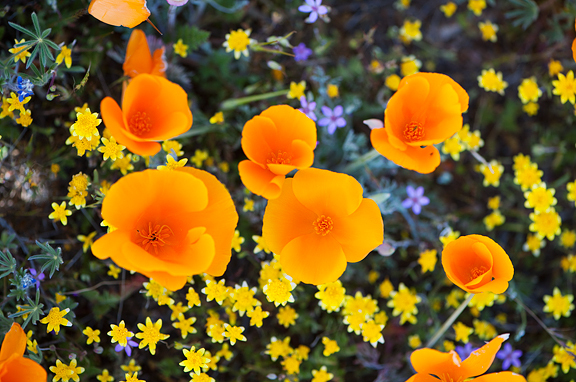 That’s why Jeremy and I detoured out to the Coast Range in search of wildflowers (and thankfully, we found some). That’s also why Jason and I were in Death Valley and Antelope Valley this week. When you have limited time and long distances to travel, planning your shoots becomes a sort of gamble. High winds made for tough shooting in Death Valley, but the weather was supposed to nice up in the next two days. We drove south to Antelope Valley and agreed if the flowers weren’t awesome, then we’d return to Death Valley for our third day. 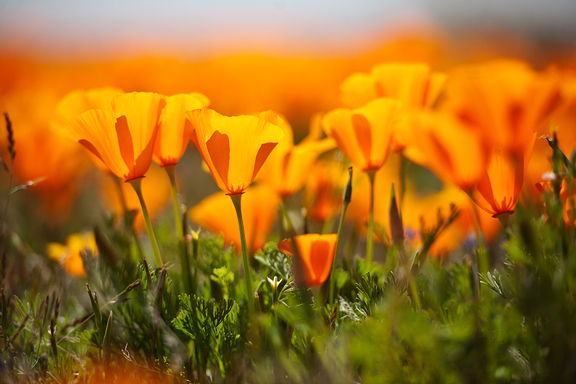 California poppies are my favorite wildflowers. FAVORITE. They were essentially at peak bloom when we arrived, so we spent our third day crawling around in the fields. We (and by we, I mean Jason) got swarmed by a nest of giant black ants and nearly stepped on a baby rattlesnake. Fun times! Some of my Death Valley shots are up on the photo blog. 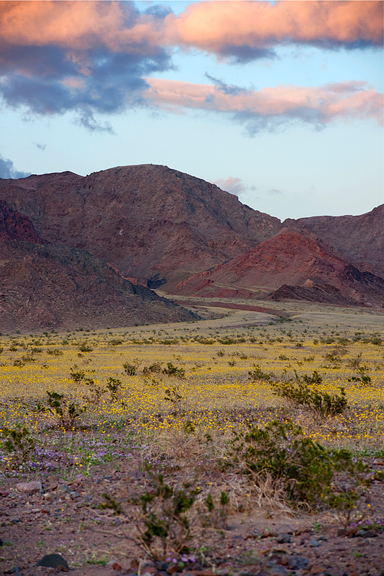 I’ll get around to the Antelope Valley photos this weekend. I processed the photos I was less enthused about first because I knew if I didn’t, I’d never get to them. Do you ever do that? 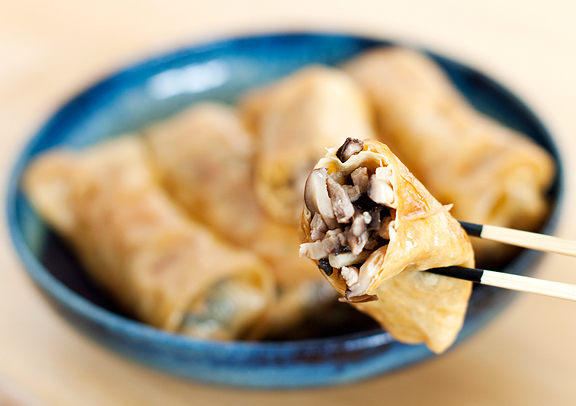 In the meantime, let’s get to a recipe… If you’ve ever had good dim sum, you might have encountered these tofu skin rolls – fu tse juan. [As my “more Chinese than me” friends know, I can’t ping ying to save my life.] It’s a favorite dish of mine: pork, bamboo shoots, and Chinese mushrooms wrapped in sheets of bean curd skin and fried then braised. I made these rolls forever ago after casually asking my awesome Chinese grandma how to do so. Chinese grandma recipes aren’t written down. They are mulled over and relayed in Chinese to granddaughters like me, who probably lose 30% of the information in translation. As if that would stop me… I’m not sure if tree ears are part of the dim sum bean curd rolls, but I put them in my filling because they are good for you and they are delicious. These bean curd sheets/skins aren’t typically found in regular grocery stores unless your regular grocery store is an Asian grocery store. I have found these locally (and when I say locally, that means in the state of Colorado) at H-Mart in Aurora, Pacific Ocean Market in Broomfield, and… I think they carry these at Asian Seafood Market in Boulder. Usually they will be in the frozen section in giant sheets. I have found them dried though. So look in both places. Sometimes they are labeled as spring roll wrappers and I couldn’t tell you why that is. 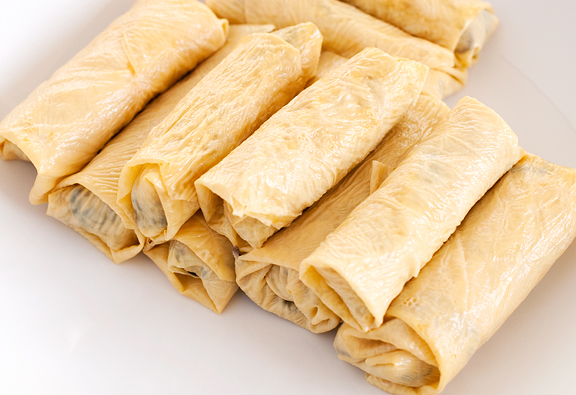 The bean curd sheets are brittle when dry, so take care when handling them. Just wipe them down with a wet cloth or rinse them under cold water and they will soon become pliable. Add a little filling and roll them up just like egg rolls or spring rolls. To help keep them sealed, I dip my finger in water and then flour or cornstarch and wipe the tail end corner of the sheet. The cooking process is two-step: 1) pan fry the rolls in a little bit of oil until the skins crisp up and 2) steam the rolls until they are soft. Before steaming, pour a little soy sauce, a dash of vegetable oil, and add a pinch of sugar into the bowl. When the bean curd rolls are ready, pour some of the juices from the bowl they steamed in over the top. If you like yours on the chewy side, then steam for less time. 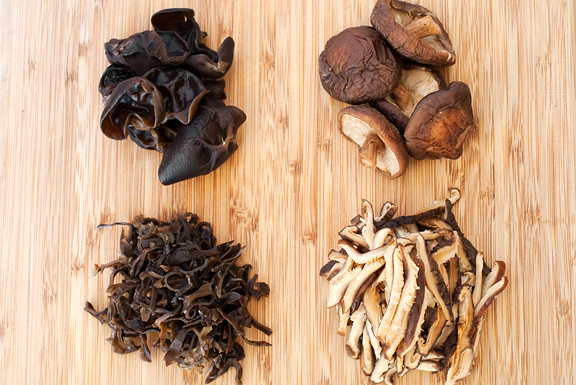 If you prefer them to be really soft and tender, steam longer. let’s hear it for chinese grandmas! 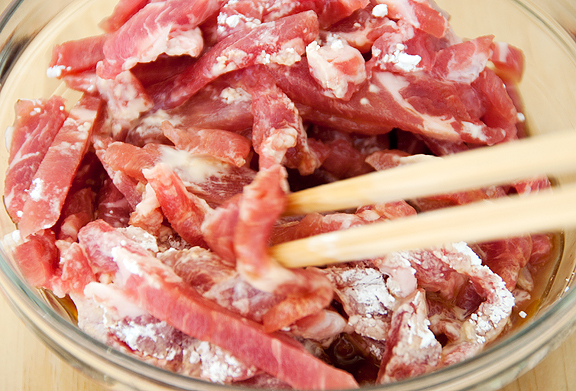 In a medium bowl, mix the pork, soy sauce, Shaoxing wine, and cornstarch together. Heat a tablespoon of vegetable oil in a sauté pan over high heat. When the oil is hot, sauté the pork until almost cooked. 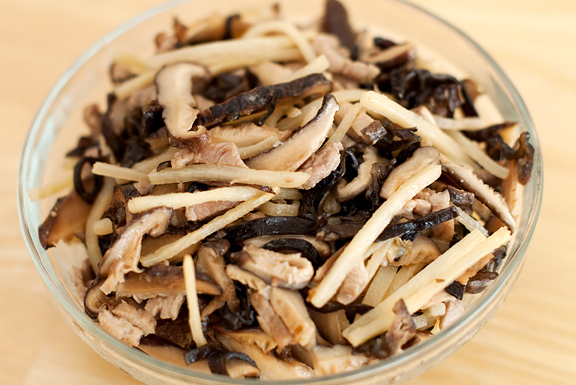 Add the mushrooms, tree ears, and bamboo shoots to the pork and stir fry for another minute. Remove from heat. If the bean curd sheets are not square or rectangular, trim them with scissors so they are relatively square or rectangular. Wet the sheets under water or take a wet cloth and wipe the sheets down until they soften and become pliable. 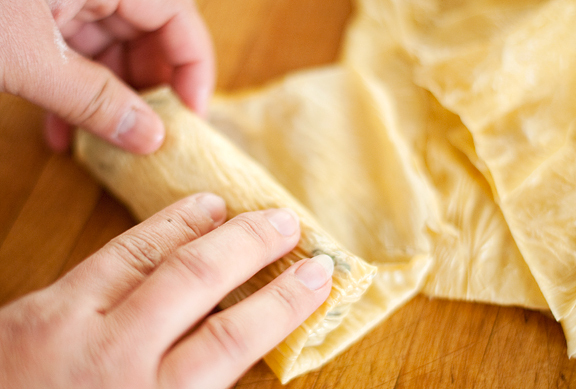 Set one sheet of bean curd skin on a clean working surface with a corner pointing at you. Place a few tablespoons of the pork and vegetable filling an inch or two from the corner nearest you on the bean curd sheet. 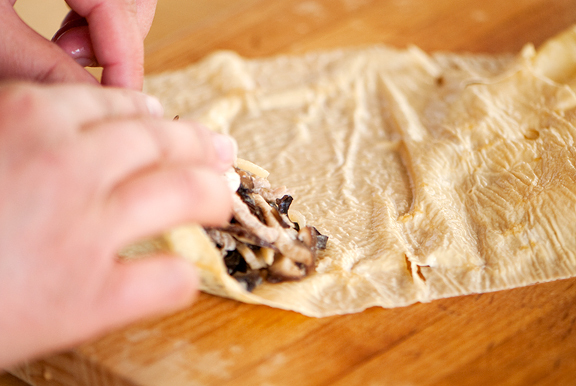 Roll from the corner nearest you until the filling is enclosed in the sheet (don’t roll too tight!). Fold in the sides to form a neat roll. Continue rolling until the last corner remains. Dip your finger in the water and then in the cornstarch and wipe the edge of the last corner. Roll up the roll and set aside. Repeat until your filling or sheets are used up. Heat 2 tablespoons of vegetable oil in a large shallow sauté pan over medium high heat. 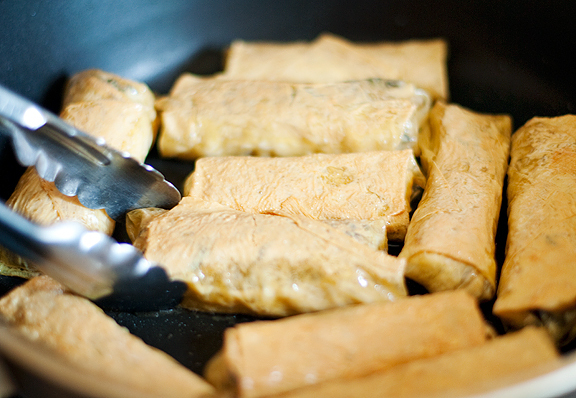 Place the bean curd skin rolls with their corner flaps face down in the pan and fry until slightly browned. Turn over and fry until slightly browned. Remove from heat and stack the rolls in a shallow bowl in a steamer. Pour a tablespoon of oil, 2 tablespoons of soy sauce, and a pinch of sugar over the rolls. Cover and steam for 5-10 minutes (or longer, depending on how soft you want the skins). Pour the catch juices over the top and serve hot. Love it. Some friends and I are regularly make the trip from Boulder/Longmont to Superstar Asian on Alameda for dim sum. You have any others you’d recommend? A lovely dish which I’ve been wanting to make since a while. 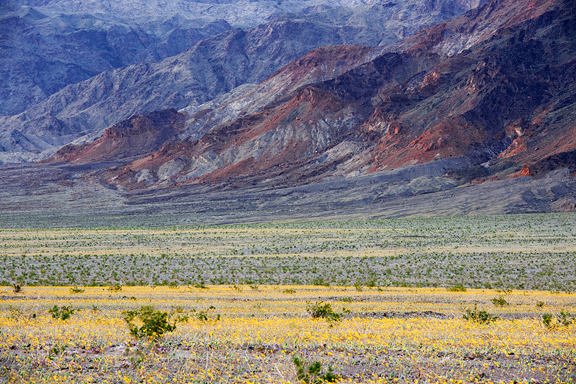 I love Death Valley, need to make a trip out there this fall….. I LOVE these! Some of my friends don’t like the texture of them but that means more for me. Does your OSOM grandma have a good recipe for sticky rice too? Beautiful, beautiful poppies. Exquisite photos. Thank you. These poppies pictures are so awesome, and I loved your recipe. You translated in a way that seems that is doable to make it at home. Thanks! You always have great recipes, that you explain to a level that make it easier. I’m so glad you share this recipe with us all! Amazing… can’t wait to try them. I’m actually heading into Chinatown, NYC this Sunday, I must pick up some dried bean curd sheets. I love your blog! Thanks again and happy cooking or baking! The “totally worth it” photo is so unbelievably beautiful. It is just breathtaking. Thank-you for sharing. Great photos. What about Chinese grandpas? Do they cook too? Sherry, you’re right, dim sum is primarily Cantonese. Nowadays, you can get them in major cities. This is one of the items that I always ordered when I am in a dim sum place. I never made it myself, but after seeing what Jen presented here, I definitely will try it soon. Wow Jen, love those wildflower photos. Thanks. The bean curd rolls look yummy. I am drooling! I will be looking for these next time I’m out for dim sum. My Californian niece is enraptured with the poppies. I see from your images that her obsession is justified. Beautiful images! And great looking bean curd rolls. Love Dim Sum! LOVE these rolls! My mom makes them once in a while. I’m not sure if she puts bamboo in -maybe I’ll suggest that to her next time. Or I’ll just quietly sit and watch her make them. Sometimes she switches from pork to chopped up shrimp… I think? Definitely makes me miss home! ALL of your photos are just amazing! Incredible pics, as usual. And I have tasted bean curds in soups, but never knew you could use them to make rolls! It looks great! These look fantastic. They’re great with Worcestershire sauce too. Yum! These look good!! I will like to dry it like you did! Question: You say to steam them in a bowel…do you mean cover them and let them sit and steam from the heat of frying, or actively have some boiling water under them? Sherry – yeah, I like the thick sauce too, but not sure what goes into it. Maybe next time I have dim sum I should spend more time analyzing the food rather than scarfing it down ;) There are different styles of dim sum from what I understand. Cantonese is the most popular and probably my favorite! 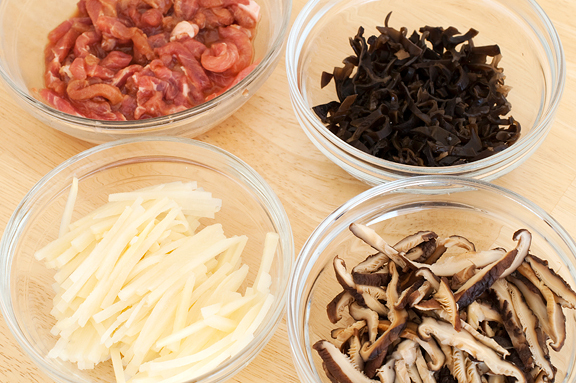 Memoria – I’m sure some Chinese Grandpas cook, but I never knew one of my grandfathers and I hardly knew the other. Wend – Oh, I meant to place them in a steamer (but in a bowl because you want to catch the juices). I love these!!! My mom makes a leftover turkey version after Thanksgiving that everyone I know LOVES (and wants to steal my portion of). 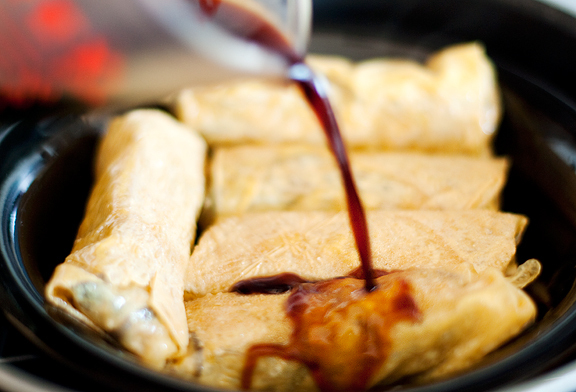 After pan-frying, she braises the bean curd rolls in turkey stock and they are so turkeylicious! I don’t find I have to moisten the ones I find around SF, so long as I don’t get a super hard frozen package. The odd bits and pieces go into a turkey congee and really smooths the consistency. Wow! love the photos, truly enjoyable. Delighted that I have found a bean curd sheet recipe after much searching. A warm thank you from British Columbia! 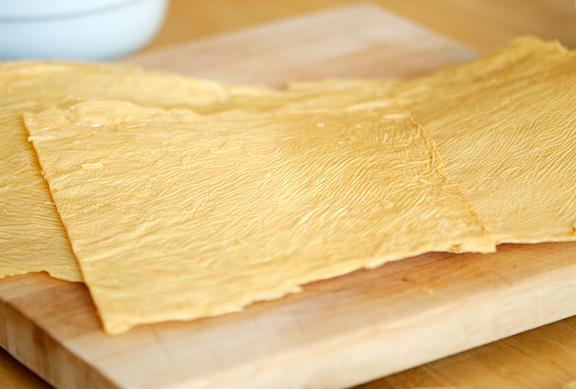 Not used bean curd sheets before, have a good idea what to do with them now! Looking forward to dinner!! Think I’m going to make them with beef and lemon grass. Some amazing photography by the way!! Hi! When I pan fry, the rolls stick to the pan (even the non-stick variety). :( I must be doing something wrong, as it doesn’t seem like anyone else has this problem. Any suggestions? I scrape the rolls off the pan and they are yummy but look sad. Teri – Hmm, the only thing I can think of is perhaps your nonstick pan is old and the surface is no longer nonstick? Otherwise, perhaps you could share more details like what kind of bean curd sheets you are using or if the filling is oozing out when you fry and possibly causing everything to stick to the pan?